Carbohydrates, or ‘Carbs’, come in a variety of forms. They can range from simple structures (glucose and fructose) to slightly more developed forms (sucrose, maltose, lactose), all known as simple-carbs (sugars). There are also more intricate carb structures – complex-carbs – that are utilized and stored by animals (glycogen) and plants (starch). Plants also create and utilize some other carbs (cellulose, hemi-cellulose, lignin) as building blocks – these carbs are known as structural-carbs (fiber). 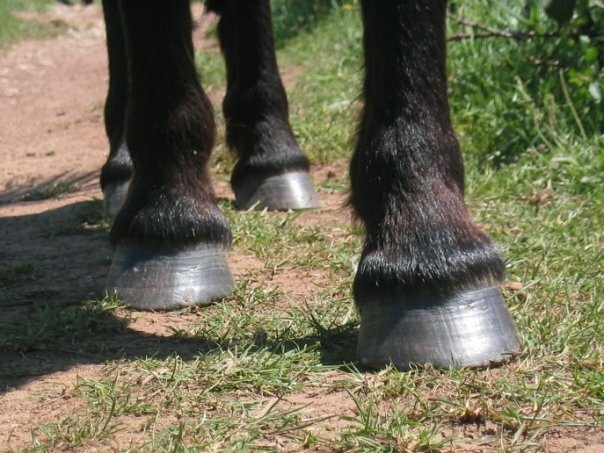 Sub-clinical laminitis is an oft-used term in barefoot circles. The idea is that your horse is experiencing an ongoing, mild – that is, ‘not clinically significant’ – laminitic event. 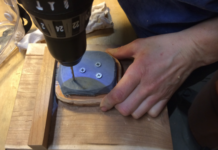 Generally, anytime your trimmer can’t get your horse moving comfortably barefoot in a reasonable time frame and your horse remains stubbornly tender footed to ride, he is assumed to have sub-clinical laminitis. I often think we are at the stage where sub-clinical laminitis is for barefooters what navicular syndrome is for shodders – a debased catch-all term used whenever your horse isn’t traveling right. Horses are, more than almost every other mammal, a walking digestive tract. The evolution of a trickle-fed, hind-gut fermenting digestive system has enabled wild (and feral) horses to survive and thrive eating energy poor – that is, low in sugars/starches, high in structural-carbs/fiber – forage on which most other herbivores would starve. Think frozen Mongolian steppe, harsh Shetland Isles, dry Middle-East desert. Remember the digestive capacity of an average size horse approaches 200 liters, some 65% of that is the fermentation vat that is the hind-gut. Horses can digest carbs in the form of sugars/starches directly. These are digested almost completely in the small intestine. Structural carbs cannot be digested directly by your horse, indeed by any mammals. Instead, microbes in the hindgut ferment structural carbs, producing volatile fatty acids (VFAs), which are then absorbed by the horse and are a significant source of energy. So what is all the fuss about carbs? 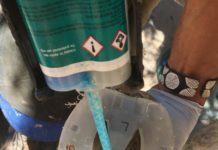 And how do carbs affect your horse’s feet? There is a limit to how much sugar/starch your horse can digest in the small intestine before it becomes overloaded. Typical examples of carb overload include 1).where your horse breaks into the feed room and eats a bag of grain and 2). a high-sugar flush in spring pastures. Sugar/starch not absorbed in the small intestine moves through to the hind-gut. Amongst the many species of microbes living in the hind-gut are Streptococci species. These guys feed on the sugars/starches (and also the complex carb fructan) that overflows from the small intestine, with lactic acid produced as a by-product. Normally this lactic acid is utilized by other bacteria but if the levels of sugar/starch/fructan is high, the Streptococci are favored and multiply quickly, so lactic acid levels rise very quickly. The hind-gut becomes acidic, with massive die back of other gut microbe species. The gut lining is damaged and endotoxins and lactic acid enter the blood stream. Your horse becomes systemically ill: cardiovascular shock, colic, fever, diarrhea and laminitis may result. How these laminitis trigger factors in the blood stream following carb overload cause laminitis is still unclear, despite extensive and ongoing research. 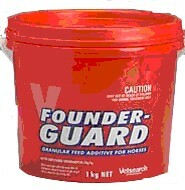 Pharmaceutical preventatives to carb overload induced laminits include Foundergaurd and Equishure. Foundergaurd is a selective antibacterial drug that targets Streptococci and effectively prevents laminitis but needs to be fed 4 days prior to a carb overload event to ensure it is thoroughly mixed in the contents of the hind-gut. 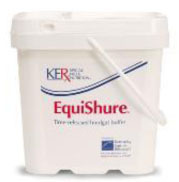 Equishure is a pH buffer – a delayed release of bicarbonate that neutralises hind-gut acidity. Again, it needs to be already in the digestive system to be effective against carb overload. Perhaps you might ask: if I am going to the effort (and expense) of drugging my horse to prevent laminitis, shouldn’t I instead improve my horse-management and simply remove the risk of carb overload? If your horse experiences ongoing, high levels of dietary sugar/starch he will, like you, develop high levels of circulating insulin (commonly termed insulin resistance). Again, the trigger is unclear, but high levels of circulating insulin correlate strongly with laminitis. Breeds renowned as being ‘good doers’, such as Arabians and the pony breeds, are more prone to insulin resistance. Remember, your horse’s ancestors evolved to thrive in biomes where calorie rich forage is rare. When he did come across a cache of sugar/starch, the subsequent rise in blood glucose was met with an oversupply of insulin. This oversupply of insulin induces glucose to be quickly laid down as fat (both intramuscular triglycerides and adipose fat). Arabians, ponies and other thrifty breeds have retained this ability: the ongoing availability of sugar/starch-rich forage for contemporary domestic horses means they often display insulin resistance and, hence, laminitis. How did your horse’s ancestors, in the absence of lush pastures and grain-feeding owners, get sufficient carbs to make enough glycogen to fuel his daily movement? Through that wonderful hind-gut fermentation process! Fermentation of structural carbs like cellulose and lignin – that is, fiber – results in VFAs that can be absorbed by your horse. Some VFAs can be used directly as energy, other VFAs are converted to fat and amino-acids. And some VFAs are converted to glycogen. 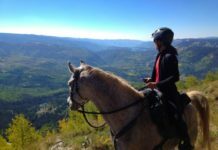 Enough glycogen for your horse to cover 20-40km daily, mostly at a walk but with enough reserves to escape predators and for the occasional amorous encounter. 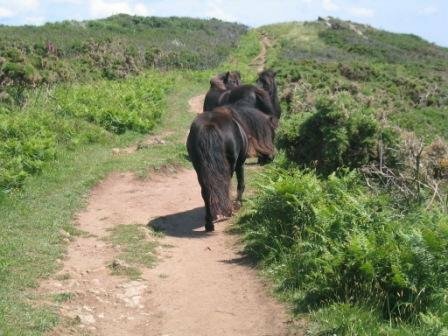 Here, Shetland ponies on coarse grazing show good health, including feet, thanks to effecient digestive systems. Exercise increases insulin sensitivity; circulating insulin levels are reduced. 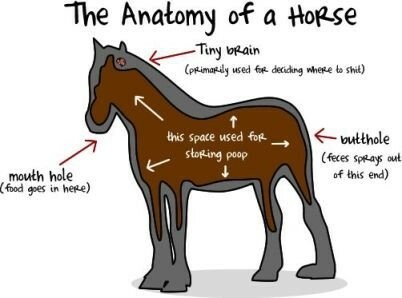 This is true in ‘normal’ and (so called) ‘insulin resistant’ horses. The best thing you can do to reduce the risk of sub-clinical laminitis is to exercise your horse. He needs to be covering at least 20km per day in turnout and/or structured exercise. The more work you give him, the higher his requirement for glycogen will be: remember, glycogen is the complex carb created by animals to utilise and store energy. Most hard-working horses, like your competitive endurance horse, are not able to replenish their glycogen needs from hind-gut fermentation alone: those hard working muscles are hungry for carbs and your competitive endurance horse is likely in a state of chronic glycogen deficit. You can deliver carbs to your horse safely. Let the bulk of carbs enter as forage (pasture/hay) for fermentation in the hindgut. For hard-working horses supplement with readily digestible sugar/starch within two hours of work. Following work carbs are rapidly absorbed as the muscle wants to refuel and rebuild. Giving sufficient carbs (eg up to 2kg of grain) immediately post-work facilitates muscle recovery and development. 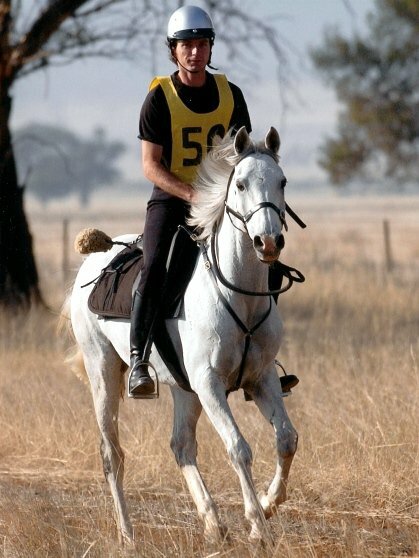 When this photo was taken, this horse was training a minimum of 80km, usually 100km and up to 150km/week, each week for several months. To provide enough sugar/starch to sustain that kind of workload he ate 6-8kg of grain (whole oats and extruded corn) mixed with beet pulp daily. Spread over 5 meals, with about 1.5kg grain per meal, carb overload issues were avoided. This on top of ad-lib pasture and hay. After several months, I had to reduce the workload: it was not possible for him to eat enough grain to replenish his glycogen needs. No suggestion of sub-clinical lamintis here. Katy Watts site, Safergrass, is the benchmark for information on pasture triggers for laminitis. The most comprehensive survey and analysis of the relationship between carb and equine performance is available free in Tom Ivers’ eBook Optimised Nutrition For The Athletic Horse.